The TETON Sports Camp Cot is an excellent sleeping option for camping or extra guests. Made with high quality, durable canvas, this cot is made to last. With a canvas travel bag included, this cot is quick and easy to set up, as well as transport. The aluminum frame ensures this cot will hold up over time. Black in color, this cot can be used to hold over 400 pounds. Order this TETON Sports Camp Cot today and experience comfortable sleeping where ever you are! Large heavy-duty Cots have a great price and a Limited Lifetime Warrant. Get a sound sleep every night with the TETON Sports Cots. Rubber feet offer protection for tent floor and the whole cot folds into a sturdy drawstring bag for carrying or stowing. Heavy-duty 600D poly canvas provides the perfect sleeping surface for the weekend camper or house guest. Family and car campers will love these cots for their easy set up. 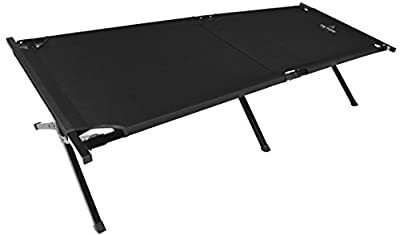 View YouTube Video "TETON Sports Adventurer Camp Cot (75" x 25", Black)"